Just six miles from the Normandy D Day beaches, Bayeux France is an excellent choice as base for European vacations to Normandy. This was the first city liberated after D Day. There is a great town center and the main street is Rue St. Jean. We thoroughly enjoyed this lovely town on our Normandy France holiday. Don't miss the Bayeux Tapestry....it is fascinating and very beautiful! The 70 yard tapestry tells the story of William the Conquerer's victory in the Battle of Hastings. There is a 15 minute film to view before you see the Bayeux Tapestry and your ticket includes an audio guide to use as you slowly "walk the tapestry". 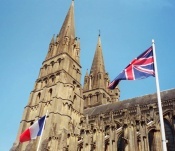 The Bayeux Cathedral is a very impressive sight with it's two towers and the combination of Romanesque and Gothic styles. It is said that the Bayeux Tapestry once hung on the arches in the nave of the church. Lace Conservatory - samples of lace from the past and a chance to watch workers who design and make lace. A "must see" side trip on your Normandy getaway is Mont St. Michel, a spectacular monastery set on a tiny island just off the coast. 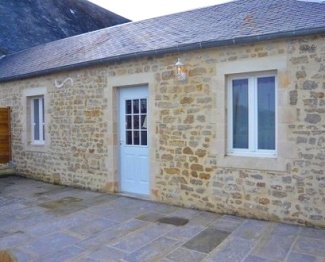 Check out these Bayeux France rentals as a great option for a family Normandy vacation or France holiday. Click on the photo or name to get detailed information or email the owner. Prestigious B&B Accommodation in historic Manoir Idyllic setting in extensive gardens and grounds. 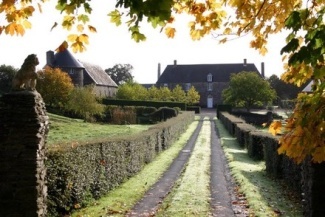 Le Manoir de Hérouville is located mid-way between Bayeux and St Lo. Within the main house there are three large bedrooms available for letting the rooms are spacious, well decorated and traditionally furnished with antique four poster king or double bed. Each has large, modern en-suite facilities and extensive views over the surrounding countryside. The Pigeonnier is both unusual and charming. It is completely round and has been arranged over three floors - the mezannine top floor as a twin bedroom, the middle floor as a galleried double bedroom with antique bed and en-suite shower room, and the ground floor has a kitchen, a seating and a dining area. Bed and breakfast guests in the Pigionnier also have the use of the kitchen and seating area using the building as an apartment, alternatively the Pigionnier may be used as a self catering cottage. A welcome pack of local produce is included in the price for self catering guests. 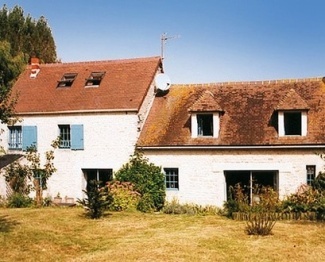 Deux Jumeaux 20 km from Bayeux France: Old house, surrounded by trees and fields, outside the resort, 3 km from the centre of La Cambe, 8 km from the sea, in the countryside. Private: meadow. Garden furniture, barbecue. Parking in the grounds. Shop 3 km, sandy beach "Vierville" 8 km. Interior: 3-room house, fully renovated in 2009: living room with TV, exit to the garden, to the terrace. 1 room with 1 x 2 bunk beds. 1 room with 1 double bed. Kitchen-/living room (4 hotplates, oven, micro wave) with dining table. Shower, sep. WC. Electric heating. Terrace 28 m2. Garden. Facilities: washing machine, iron. Panoramic view over the countryside. Martragny 8 km from Bayeux: House, in the resort. Private: grounds 670 m2 with lawn. Parking. Shop 3 km. Please note: car essential. Access to the lawn via a small set of steps. A "lavoir" (an old washing area) (10 x 10 m, depth 0.50 m) is situated opposite the house. Interior: 6-room house 155 m2 on 3 levels, nice furnishings: entrance hall. Living room 43 m2 with open fireplace. Kitchen (4 hotplates, oven, dishwasher, micro wave, freezer) with dining table. Sep. WC. Upper floor: 1 room with 1 double sofa bed. 1 room with 1 double bed (1 x 140 cm, length 190 cm). Lounge with sloping ceilings with TV. 1 room with sloping ceilings with 1 double bed (1 x 140 cm, length 190 cm), bath-room. Shower/WC. 2nd upper floor (spiral staircase): 1 room with sloping ceilings with 2 beds. There are many places to eat in this charming town. Le Pommier has excellent French food and is a good place to eat on a romantic weekend break. The other place to try for a "fancy meal" is the restaurant in the Hotel le Lion d'Or. You can eat outside on Rue St. Jean at La Fringale for a simple, reasonably priced meal. For a quick take out....salads, quiches and more....check out the deli, La Chaumiere. We went to the Saturday market in Place St. Patrice and it was great fun with its live animals, variety of food and other items. Enjoy your Bayeux France Vacation!